Simpson London is renowned in its expertise for fashioning exotic skins into desirable accessories and small leather goods. 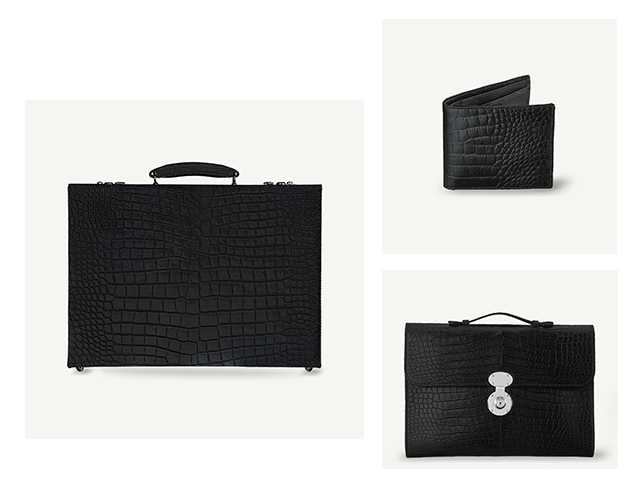 Here we highlight our favourite pieces in matt black crocodile from our new collection. Top left: The Simpson London Trifold Wallet is produced from the finest crocodile making this wallet a much coveted timeless piece. Middle: The Matt Black Crocodile Shut Flush case is finely handcrafted from a Cedar Wood shell and fitted with a polished nickel key lock. Features tone-on-tone stitching and matching luggage tag. Bottom left: The Simpson London Crocodile Envelope Folder. Constructed to be light in weight for ease and comfort, this case will hold a small laptop, whilst leaving enough room to slide in papers and periodicals by it’s side. All Simpson London Crocodile skins are only sourced from the world’s most respected tanneries.